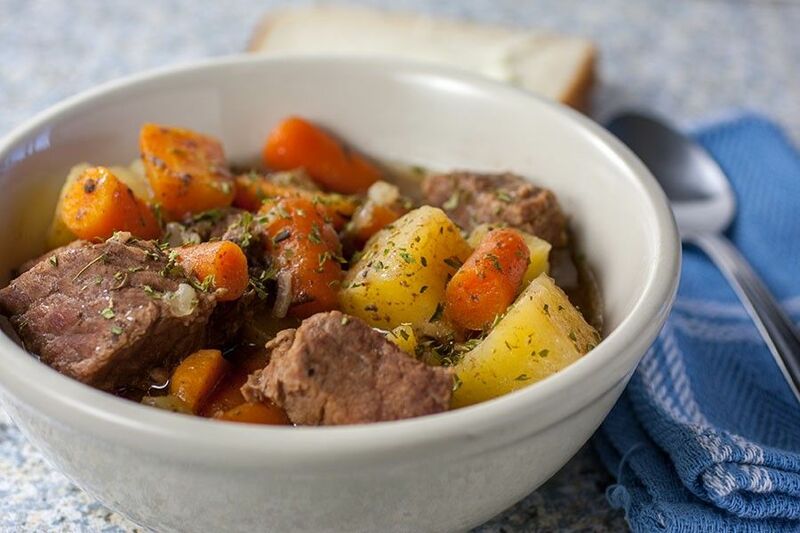 Fresh beef stew in a white bowl with carrots and potatoes. In the fall, we all look forward to old-fashioned but timeless comfort food that is simmered for a long time and leaves a delicious aroma around the house. One such dish is typical to Northern France and Belgium: Flemish Beef Stew. There are several versions regarding the origin of this dish. Some say it is a cousin of beef bourguignon, with beer instead of wine, while others call it a typical Flemish dish. There is even a rumour that it was created by coalmine workers, hence the French name “carbonade” (“charbon” means coal in French). Whatever anyone says, slow-cooked meat dishes are universal and a traditional way of making less noble pieces of meat tastier. In Belgium, where this stew is the national dish, bread with mustard spread on it is added at the end of cooking to give a unique texture to the sauce, depending on the recipes and places. The dish also calls for Rodenbach beer, but you can replace it with any good red beer (Belgian, if possible!). Originally published in the Journal de Montréal on September 7, 2013.